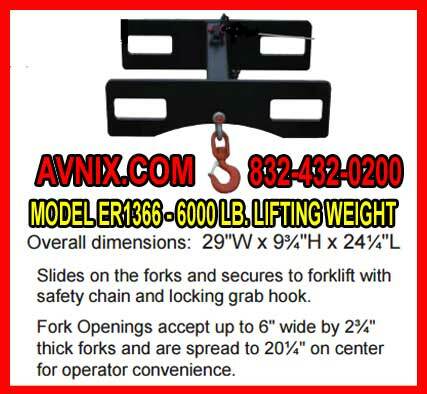 Model 1377 Lifting Hooks 832-432-0200 – Fork Pocket Size: 24” long x 8¾” x 3½” ID / Center to Center of Fork Pockets: 34″ / Pocket Ends are open. 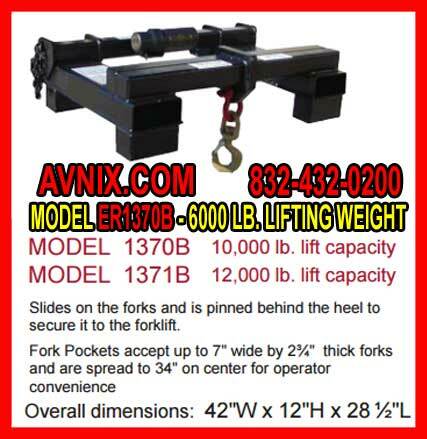 Avnix industrial grade forklift hook attachments are designed for lifting heavy loads safely & securely and to utilize the full capability of your forklift . 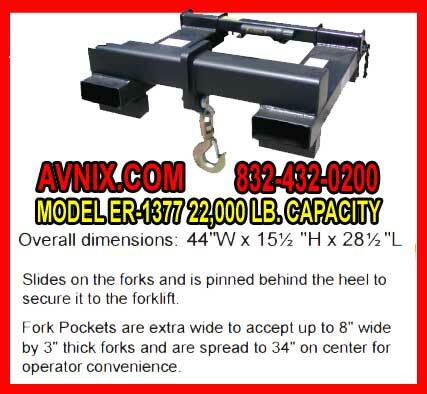 The hook point is situated at the standard 24″ load center where most forklifts are rated. Lifting hook can be used with both straight mast and extendable reach forklifts. Heavy duty swivel hook with latch and screw pin anchor shackle are included. strong heavy duty design ensures a long and productive life. Lifting hook attachment slides on the forks and is pinned behind the heel to secure it to the forklift. Model ER1366 – Fork Opening: 6¾” x 3″ ID / Center to Center of Fork Opening: 20″ / Ends are open. Model ER1370B/ER1371B – Fork Pocket Size: 24″ long x 7½” x 27/8″ ID / Center to Center of Fork Pockets: 34″ / Pocket Ends are open. Model 1377 – Fork Pocket Size: 24” long x 8¾” x 3½” ID / Center to Center of Fork Pockets: 34″ / Pocket Ends are open. CAUTION~ Don’t get a citation ~ OSHA prohibits straps, cables or chains around bare forks. Occasionally you do not have access to a crane, or you have a load that is too small to validate the use of a crane. Nevertheless, you can not pick it up manually or by any other means, but as an alternative you must have to suspend it from a forklift and lift it to a more elevated location by raising the forks to the suitable height. Never try to chain the object to the forks. A lifting hook, by definition, is an forklift attachment with two fork pockets that slide onto the forks. Sandwiched between this attachment there is a swivel hook positioned at 24”. The unit is secured to the forks by a heavy duty chain. This keeps the unit from sliding past the 24 inch mark, which is vital to safe operations. The cause for this is lies in the way the forklift itself is built. The load center of a standard fork truck is 24 inches. Anything located ahead or aft of this built-in center of gravity throws the whole vehicle a little off balance. This may be something you can get away with if you are lifting an unusually light load. On the other hand, if you are lifting anything of considerable mass, you run the danger of losing your contents on the ground, or even worse, overturning the vehicle or injuring a employee.